Europe and organic waste - EU biowaste law needed! Organic waste –the substance that come from living organisms- represents the biggest fraction of our municipal waste in Europe; between 30 and 50% depending on local conditions. As such, we would expect it to be taken good care of; the carbon present in all organic waste can be very good if brought back to the soils but it can be very bad if it is released to the atmosphere where it worsens climate change. More concretely, if treated properly, biowaste in Europe could improve 3 to 7% EUs depleted soils, could subsitute 10% of phosphate fertilisers, 9% of potassium fertilizers and 8% of lime fertilisers. The European Union has a contradictory policy regarding treatment of organic waste. On one hand, in the Soil Thematic strategy it acknowledges the need to replenish the carbon-depleted soils and to increase nutrient retention and soil productivity. On the other hand, in the renewables directive the priority is to move away from fossil fuels and contemplates biomass as a way to achieve this goal. The carbon contained in organic waste, green waste or paper is “young carbon” –as opposed the the old carbon of fossil fuels- and although all carbon, regardless of its origin, is equal when emitted to the atmosphere the EU considers burning “young”carbon as climate neutral. Hence, preference is given to burning organic waste in biomass and municipal solid waste incinerators in front of bringing the carbon back to the soils. Finally there is the Waste Framework Directive where there is the waste hierarchy expressing the priority in treatment processes for waste: first prevention, then reuse, then recycle and compost, then energy recovery and finally disposal. 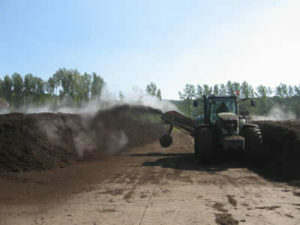 Therefore, in theory, composting has priority to burning the biowaste with energy recovery as waste treatment. The waste hierarchy is supposed to be legally binding with only deviations allowed in concrete cases. In practice, that is what counts, the situation is the following: 70% of the Eu funding for waste management goes to finance building new incinerators and the consideration of burning biomass as renewable energy allows to provide premiums for the energy produced from burning biowaste. At the same time the savings in emissions and energy provided by composting and anaerobic digestion are not rewarded with any kind of subsidy or premium. From an energetic point of view, studies show that composting is twice as good as burning biomass when the calorific value is low, and as good as burning biomass when calorific value is high. From a climate change point of view keeping the carbon in the soils is better than releasing it to the atmosphere. From a biodiversity point of view it is a lot more useful to build organic matter and replenish soils than, for instance, burn valuable peat. Firstly, a narrow-minded short term vision that prioritises energy generation before environment, climate and future soil productivity whose benefits, albeit a lot more important, are not immediate. 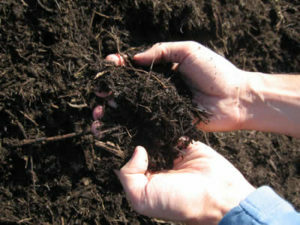 Secondly, the value of of compost is low and the cost of collection and separation of biowaste is seen as too expensive. This is because replenishing the soils, albeit recognised as very important, has no market value and because the view on waste management is not wholistic. In a wholisitic Zero Waste approach all the costs and benefits are considered. That is; the sometimes higher costs of separately collecting and managing the organics is compensated with the higher benefits of recovering value in the other waste streams thanks to the increase in its quality and the reduction in disposal costs of having a higher recycling rate. In reality, when we look at the short and long term costs and benefits bringing the carbon back to the soils is and will be a lot cheaper than releasing it to the atmosphere. The issue of creating a biowaste directive has been in the pipeline since 1998 but so far the European Commission, despite the overwhelming evidence and claims from many NGOs, industry and countries such as Germany or Spain, has refused to draft such a directive. The most likely reason for this stubborn opposition to a biowaste directive is that the EU counts on burning biowaste as a mean to achieve its targets of 20% renewable energy for 2020. In other words, the non-written decision happens to be the most important: producing energy has priority before the quality of the European soils and the future costs and sustainability of the resources management of the EU. Yet, regardless of the financial incentives in favour of burning biowaste it is still up to the competent authorities to chose which treatment to give to their biowaste. In Germany for instance, more than 2/3 of biowaste from households is separately collected and there are plans to extend mandatory separate collection of biowaste to all municipalities. At regional level there are also initiatives; in Catalonia for instance a new law mandates to separately collect biowaste. On the other hand, countries such as France prefer to burn the biowaste mixed with the rest of the waste. A Zero Waste strategy for Europe implies proper biowaste separate collection and a treatment that can be sustainable in the long term. 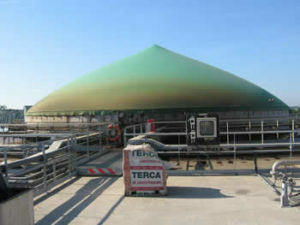 Energy can be produced through anaerobic digestion but most important is the long term energy savings of bringing the carbon back to the soils and educating the population about the need to respect the cycles of nature. Zero Waste is about eliminating waste in order to share resources with the future generations and recycling organic waste is the best way to feed the future of our children.